A major snow storm has hit while Stephen is away on a business trip and his flight home has been cancelled. He wants to get back home in time for his daughter’s first piano concert that evening, but there are only a limited number of flights available. The major problem is he is one of hundreds of other travelers who are also vying for those last seats. While Stephen’s dealing with the stress of trying to get home, he receives an anonymous call and automatically declines it, assuming it was one of those annoying telemarketers. Unfortunately, this time it was a call he needed to answer. The call was from the agent Stephen spoke with earlier; he missed his opportunity to book the last available flight and will not make it home in time. Consumers know that especially in times of emergency, scammers use the opportunity to take advantage of people who are highly stressed. They’ve heard about scams where the caller pretended to be a transportation provider or a hotel who will take you in for a fraction of the cost as long as you pay now. Since your customers do not want to be a target for this kind of ruse, they refuse to answer calls when they do not recognize the number or calling name. When major weather events happen and travel plans are cancelled en masse, all eyes are on your customer service team to see how the situation is managed. Creating an open line of communication goes a long way to help keep customers calm in these stressful events, and is even an opportunity for your brand to create a positive customer experience, despite a negative situation. 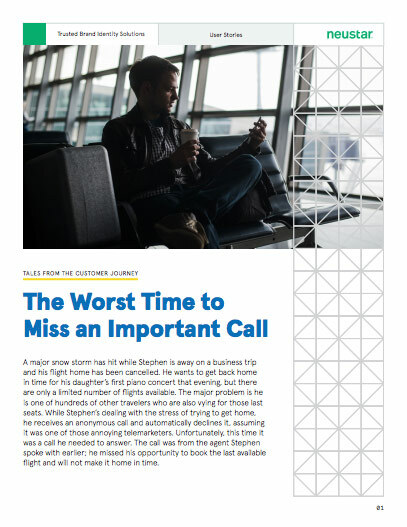 When time is of the essence for important calls, delivering an accurate and consistent calling name and number will make it more likely your customers will pick up the call or listen to their voice mail.